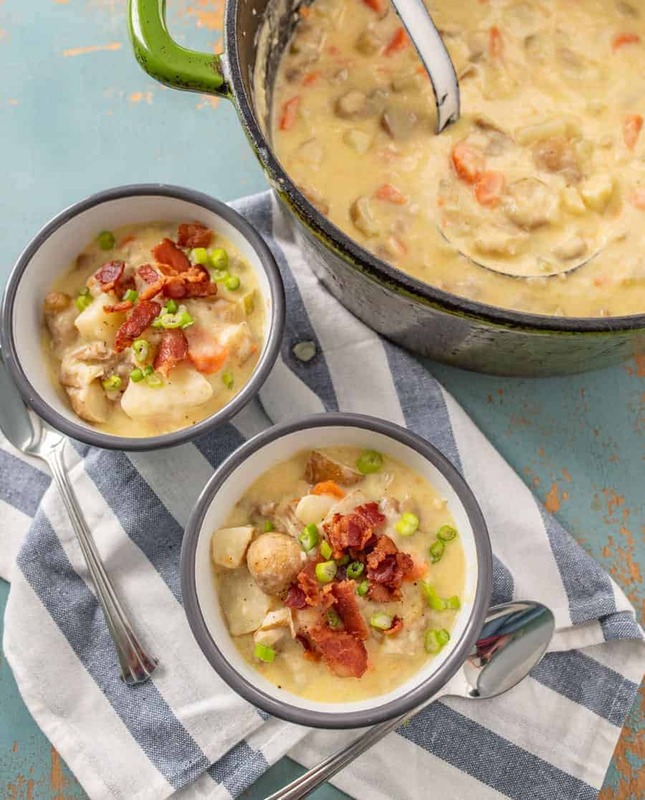 Classic creamy potato chowder with bacon, veggies, and potatoes, made creamy with sour cream. This easy recipe can be made in the slow cooker or the instant pot! This is one of the oldest recipes on Bless this Mess and it’s getting a much needed make-over. I shared this recipe back in 2009 and I have recently updated the pictures, the post, and the recipe to get it ready to share with you again. Updating really old content is really fun for me because I shared some of my very favorite recipes early on in blogging. I shared them because I loved them, made them often, and knew they were solid recipes. So excited to be bringing this old favorite back into the spotlight today. 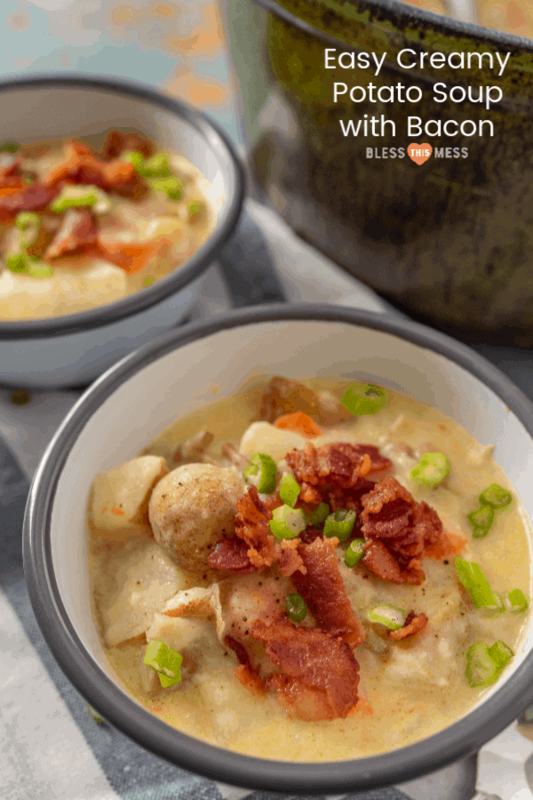 Creamy potato chowder is a favorite in our house because it’s simple to make, loaded with bacon, and extra creamy thanks to the use of sour cream to finish off the soup! 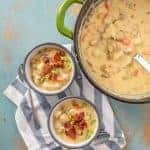 This is one of those soups that you can top with just about anything, like additional bacon, cheese, green onions, or hot sauce. My kids love it when they have a lot of options for topping their soup. This recipe is a great one to feed a crowd, too because it’s very easy to scale up and down and having the potatoes as the star of the show makes it very economical. I make this on the stove top, in instant pot, and in the slow cooker. The stove top directions are in the recipe and the Instant Pot and slow cooker directions are noted in the blog post. Feel free to peel the potatoes or not, depending on your preference. This busy mama rarely peels the potatoes and it tastes just great. If you’d like to make this a cheese soup, reduce the amount of sour cream to 1/2 a cup and add 1 to 2 cups sharp cheddar cheese at the end of cook time. Stir until melted and well combined. Feel free to use chicken broth instead of water and bouillon if you have it on hand. You can add an additional 1 to 2 cups water to this recipe if you like; it’ll make a thinner soup. Just adjust it to your liking. You’ll want to cook up the bacon on the stove top as directed in the recipe. Continue through the steps that cook the onion and garlic, too. Add the cooked onion and garlic to the base of your slow cooker and add the rest of the veggies, water, bouillon, and salt. Cook on high for 4 hours or low for 5-6 or until the potatoes are tender. Stir in the sour cream and bacon just before serving and adjust the salt and pepper to taste. You’ll want to cook up the bacon on the stove top as directed in the recipe. Continue through the steps that cook the onion and garlic, too. Add the cooked onion and garlic to the base of your Instant Pot and add the rest of the veggies, water, bouillon, and salt. Set the pressure cooker to cook for 8 minutes on high pressure. When the cook time is up, release the pressure valve for quick pressure release. Stir in the sour cream and bacon just before serving and adjust the salt and pepper to taste. 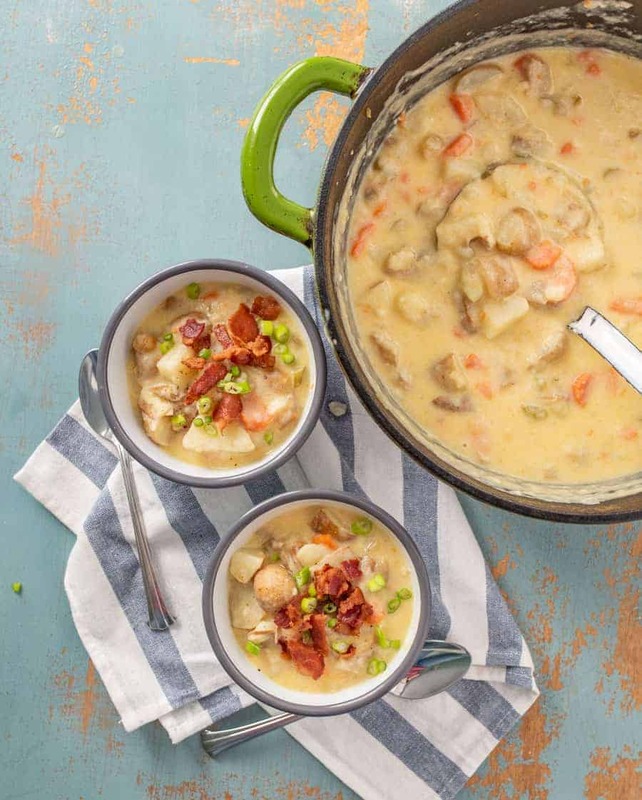 Classic potato chowder recipe with bacon, veggies & potatoes, made creamy with sour cream. 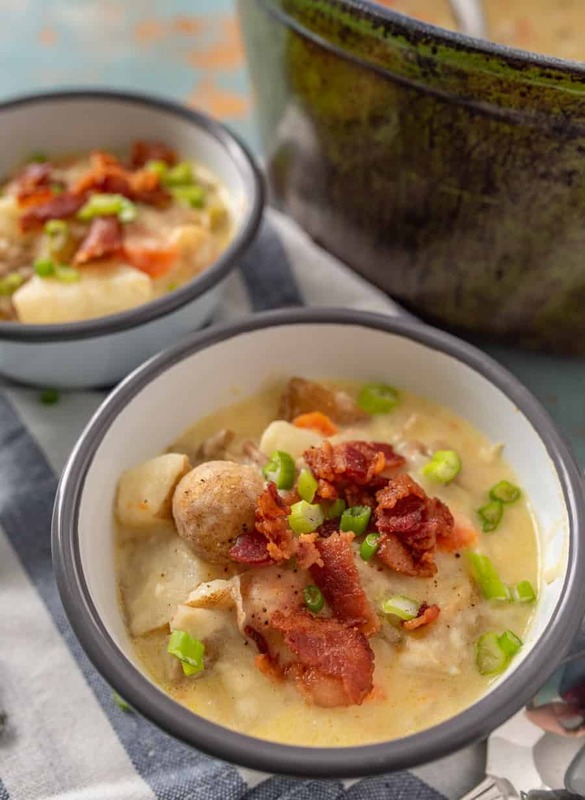 This easy recipe can be made in the slow cooker or instant pot! Cut bacon up into 1/4 inch pieces. Add to a large pot or dutch oven and cook bacon over medium high heat until crispy, about 10 minutes. Remove bacon with a slotted spoon leaving the drippings. Keep enough bacon drippings to cover the bottom of the pot (about 2 tablespoons), and remove the rest. Return pot to heat and add onion. Cook onions until translucent and soft, about 5 minutes. Add potatoes, carrots, celery, water, bouillon, and salt. Bring soup to a boil, reduce heat to medium low and cook until veggies are soft, about 30 minutes. Remove from the heat and stir in the cooked bacon and sour cream. Salt and pepper to taste. Feel free to peel the potatoes or not, depending on your preference. This busy mama rarely peels the potatoes, and it tastes just great. There you have it – one beautifully updated tried-and-true recipe that I can’t wait for you to make. Enjoy this rich and creamy soup from my kitchen to yours. This recipe was originally published in December 2009 and has been updated, rephotographed, and rewritten in December 2018. I recently made a similar recipe…turned out soooo yum 🙂 Im going to try your version today with the sour cream. Thanks.